Note: Before we start, it must be pointed out that in no way does FashionBeans condone the use of real fur within fashion. We are, however, dedicated to making you aware of all the latest menswear trends, and as such will present an unbiased report. Many of the items featured or described in the piece are actually faux fur, although from here we will describe all variants as simply ‘fur’, for ease. Last week, we documented how shearling is set to become a popular fabric choice for men in the colder months ahead. But that’s not the only animal-inspired trend that is set to make its mark this year. Yes, from full coats to simple detailing, fur is back on the menswear agenda. 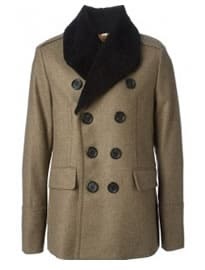 Once the epitome of elegant femininity during the 1950s, as time has gone on designers have pushed the boundaries, blurring the lines between the sexes and using fur to add a sense of luxury and sophistication to men’s outerwear. Yet despite fur falling in and out of vogue quickly, it remains a contentious subject not only due to the obvious morality issues it throws up, but also the fact it is still considered a fashion-forward concept in menswear. Spotted at all the global fashion weeks, this is a trend that was hugely popular amongst designers this season – and it seems to have filtered down into many high street collections too (if the latest lookbooks are anything to go by). This may not make the idea of fur any more appealing to the majority of men out there, but it certainly means there will be a lot of supply to meet any demand there might be. When you think of a fur coat, the terms ‘full-length’ and ‘all-over’ probably spring to mind – a frightening thought for most gents, who would rather look stylish and elegant as opposed to an urban yeti or Kanye West wannabe. However, although there were several designers who featured adventurous, full-length fur outerwear in their collections, there were a lot more pieces that applied fur in more subtle, wearable ways. We can’t discuss the subject of fur without first mentioning the AW14 showcase from Fendi, which took the concept so far that even their eighty-five metre runway was completely covered in Kidassia goat fur – described by Shortlist magazine as “a hairy-luxe platform”. The fur theme continued into the collection in a variety of guises, from a black leather and fur panelled jacket, to full-length fur overcoats, to fur-covered baseball caps, scarves and mittens. Fendi kept things interesting by mixing fur with other fabrics – we saw several leather jackets in various lengths with fur layered over the top, creating an interesting mish-mash of textures. There was also a short hair fur bomber jacket, as well as a cropped black fur waistcoat worn over a black and white overcoat for a directional, layered look. Other designer collections that featured dramatic full-length fur coats included Burberry Prorsum, Dior Homme, Dolce & Gabbana and Roberto Cavalli. Several of these pieces conjured images of Vikings and touched on regal/historical influences, perhaps encouraged by the recent popularity of TV series Game of Thrones. Dolce & Gabbana even went as far as to send some of their fur-clad models down the runway wearing crowns. The brand followed this up by showing fur overcoats and sweaters featuring cross emblems and armoured knight prints. Fur accessories were another prevalent theme running across the shows, with Bottega Veneta’s sumptuous wide scarves in luxurious green fur a particular highlight. The use of fur for garments other than outerwear was also extremely popular with designers, offering a unique and contemporary take on the trend. For instance, Emporio Armani included a jumper with a fur chest panel and contrast fabric sleeves, as well as all-over fur sweaters. Similarly, Louis Vuitton showcased a v-neck jumper with a central fur panel across the torso and chunky knit sleeves, while Gucci crafted an oversized fur jumper in deep marine blue. Dolce & Gabbana, on the other hand, took a more casual approach, showing a large oversized fur sweatshirt – it isn’t often that you see fur applied to sportswear, but it shows the trend is evolving. Likewise, Ports 1961 included a pony hair hoodie in their collection. Patchwork fur, and the mixture of fur with other fabrics, was another common theme, with Valentino featuring a patchwork fur coat that mixed several different types and colours of fur together in various lengths. The brand would later go on to show a bomber jacket complete with fur and leather panels. Much like with shearling, the practicality of wearing an all-over fur piece day-to-day is not that high. 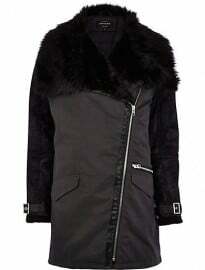 Pieces that utilise fur as an accent or for detailing are much more likely to have mass appeal. Think fur collars and lapels rather than an all-over, floor-length fur coat. Ideal for party season or adding a luxurious touch to your formal wear, Esquire has already applauded the frequent use of fur on collars at New York Fashion Week, while Shortlist magazine championed the return of the iconic khaki parka jacket, complete with its fur-trimmed hood and shearling lining – both publications supporting the ‘less is more’ line of thinking. As this is an advanced trend report, there is currently very little available online (other than expensive high fashion pieces). Fur will forever remain a contentious trend, but hopefully the fact that it is being interpreted in new ways will work in its favour. As GQ wittily claim on the subject of the resurrection of fur in menswear, there is a current “re-fur-gence”.